While it should be a given that the contractor you choose for you new home or remodel project is qualified to do the actual work, we understand that the most important service that we provide is relationship based on trust and communication. Whether it is a one week deck project, a 3 month basement finish or an 8 month new home build, we are going to be an intimate part of our clients' lives for the duration of the project. If our clients don't already trust us or we haven't established good communication before we start the project, then having to make countless decisions can be a stressful process. We want our clients to be comfortable with the relationship they have built with us prior to us being on site and to know we are accessible to them at any time. If we do our job correctly in building the relationship, we can greatly minimize the stress of building/renovation for our clients. 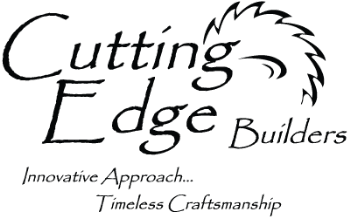 Cutting Edge Builders is a company that values relationship and communication.